One of the ways you can use Personyze’s powerful recommendation engine is to show product recommendations with bundles dynamically generated from transactional data. This type of recommendation has been proven highly effective at increasing avg. order value, and requires no insights or effort from your team to group the products together, as they are based on algorithms and crowd data from all shoppers. 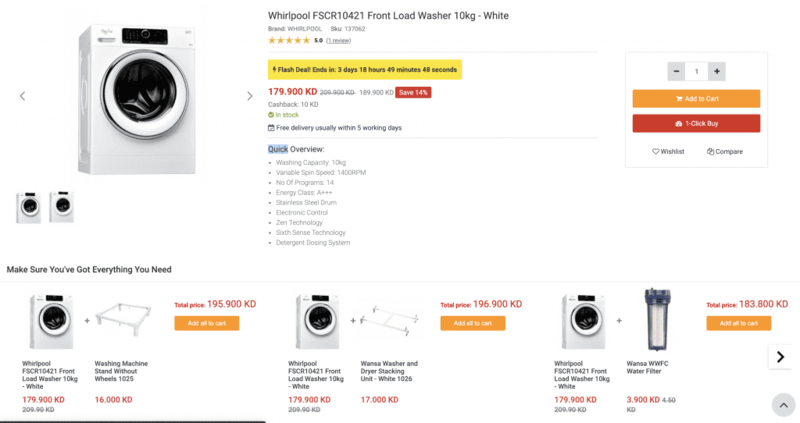 On a home appliance store’s website, a visitor is viewing a laundry machine. Because this site is using Personyze’s dynamic Frequently Bought Together bundles recommendation, the visitor will see several bundle options based on what other visitors with similar characteristics bought together most often, in the same transaction, or within a few days. These characteristics could be location, demographic, or other data. Leveraging crowd wisdom data plus the convenience of a one-click bundling with relevance of suggested items guaranteed by other shoppers’ habits consistently results in not only better sales, but a better shopping experience. Very often, the items that are suggested may be ones that the visitor would never have otherwise thought about needing, until after their package had already arrived. For example, a mobile microphone which requires an adapter to connect to a cell phone. This is also a widget that gets better with time; because it’s based on machine learning, the more data that is accumulated, the more and more accurate the recommendations will become, and can be counted on to generate a significant percentage of your sales. The best part is that the engine and the shopper data are doing the work for you. Set up your product feed and interactions, if you haven’t already (one-time integration required for all recommendations). Select the Recommendations Campaign Wizard, and click to add a new recommendation widget. Set whether the items recommended must be from the same cart purchase, or simply within a certain time-frame, or let the system determine the best approach at any given time. Set a minimum threshold of transactions before a recommendation will be shown, or by default Personyze will start after 2 users bought items together. Set the number of items that can be included in the bundle. You also have to option to set up an ultra-convenient, one-click “Buy Now” button for this widget, which requires some integration with your site. By default, Personyze has integration for this feature with Shopify, Magento, and WooCommerce, you’ll just need to select the right add to cart script that allows Personyze to run, to include the current item along with the recommended cross-sell item. If this is too complex, simply ask the Personyze team for assistance, we can set it up for you. You can also upload your past transactional data to Personyze, to give the recommendation engine a head start on achieving high relevance. This reduces the time it takes to collect the necessary data from real-time transactions tracking to make insightful product suggestions. As the Personyze team for help uploading your past transactions.